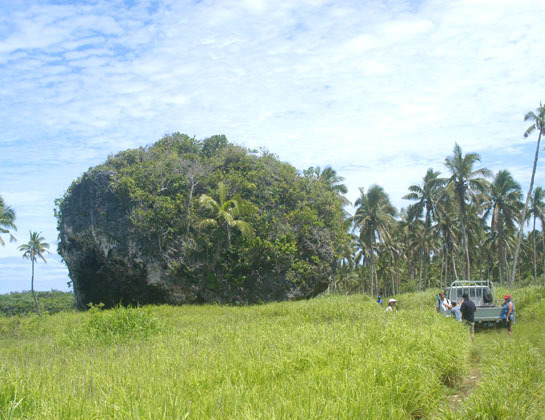 Up to 9 meters (30 feet) high and weighing up to 1.6 million kilograms (3.5 million pounds), the seven coral boulders are located 100 to 400 meters (300 to 1,300 feet) from the coast. Called erratic boulders, these giant coral rocks . . .are at their present location on Tongatapu, Tonga’s main island. Because the island is flat, the boulders could not have rolled downhill from elsewhere. The boulders are made of the same reef material found just offshore, which is quite distinct from the island’s volcanic soil. In fact, satellite photos show a clear break in the reef opposite one of the biggest boulders. And some of the boulders’ coral animals are oriented upside down or sideways instead of toward the sun, as they are on the reef. Hornbach says the Tongatapu boulders may have reached dry land within the past few thousand years. This suggests the area was scoured clean by waves in the recent past. Finally, there is no limestone pedestal at the base of the boulders, which should have formed as rain dissolved the coral if the boulders were much older. Many tsunamis, like the one that struck the Indian Ocean in 2004, are caused by earthquakes. But the boulders’ location makes an underwater eruption or submarine slide a more likely culprit. A chain of sunken volcanoes lies just 30 kilometers (20 miles) west of Tongatapu. An explosion or the collapse of the side of a volcano such as that seen at the famous Krakatau eruption in 1883 could trigger a tremendous tsunami. 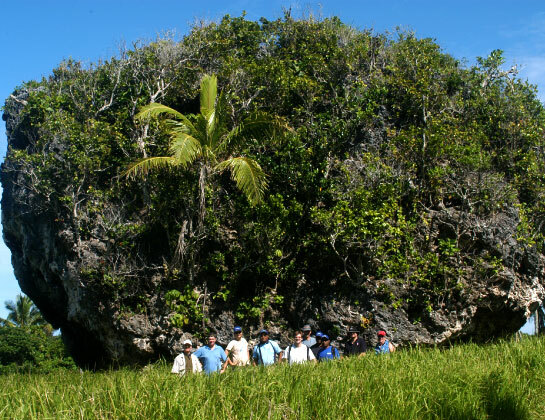 The boulders are such an unusual part of the Tongan landscape that tales of their origins appear in local folklore. According to one legend, the god Maui hurled the boulders ashore in an attempt to kill a giant man-eating fowl.